Ever wondered what Scouting Awards exist? Seen a Medal or cloth emblem and not known what it represents? Listed here are all the Awards and their associated Medal and / or Emblem. Service Awards are made to all Adult Members and Employees on the completion of the relevant period of Adult service. Service in Operational positions, (i.e. warranted positions), in Administrative positions (i.e. appointed positions) in the Scout Movement and Adult service with the Guide Association are recognised as qualifying service. Youth service as a Cub, Scout, Brownie, Guide or Ranger Guide are not recognised as qualifying service for the purpose of this Award. The Long Service badge is awarded on completion of 5 or 10 years adult service to the Movement. The award is a cloth Protea badge depicting the numeric years’ service completed. This is accompanied by a Certificate signed by the Regional Commissioner. The Long Service Medal is awarded after 15 years total Adult service and is accompanied by a Certificate signed by the Regional Commissioner. This replaces the 5 or 10 year badge. Ribbon: Yellow, red, yellow border with green centre. Cloth emblem: a figure-of-eight knot in green with yellow, red and yellow ends. Bars to the Long Service Medal Bars to the Long Service medal are awarded on completion of 20 years, 30 years, 40 years, 50 years, 60 years and 70 years qualifying service. They are accompanied by a Certificate signed by the Regional Commissioner. Awarded to Members for special short term interventions or acts of service to the Movement, the public or a community at Unit, Group, District or Regional level. The Commendation is a Certificate and personal letter from the Regional Commissioner commending the recipient(s) for the services rendered. The commendation is made at the sole discretion of the Regional Commissioner. Awarded to Members for outstanding services rendered to the Movement, the public or a community where the service is of National or exceptional significance. The Commendation is a Certificate, signed by the Chief Scout and a personal letter from the Chief Scout commending the recipient for services rendered. Awarded to Adult Members and Employees, normally with at least 5 years’ Adult service, for above-average performance in their Warranted or Appointed position. The Award is a Certificate, signed by the Chief Commissioner, and a cloth emblem which consists of a figure-of-eight knot in white with green ends. Awarded to Adult Members and Employees, normally with at least 8 years’ service for above average performance and meritorious service performed at Group, District or Regional Level. The Medal is attached to a dark green ribbon and accompanied by a Certificate signed by the Chief Scout. The cloth emblem consists of a figure-of-eight knot in green. On the recommendation of the Chief Commissioner or Regional Commissioner, the spouse /partner of a recipient of the Medal of Merit may be presented with a broach and citation recognising the support they have given to their partner. Awarded for further above average and meritorious services, in addition to those considered for the Medal of Merit. The award is a bronze fleur-de-lys worn on the medal ribbon and accompanied by a Certificate signed by the Chief Scout. Awarded by Scouts South Africa for distinguished Service. The Order comprises a silver medal in the form of a Protea surrounded by a Wreath on a yellow ribbon. It is accompanied by a Citation and a Certificate signed by the Chief Scout. The cloth emblem consists of a figure-of-eight knot in yellow. A miniature lapel badge may be worn by administrative members or employees. On the recommendation of the Chief Commissioner or Regional Commissioner, the spouse / partner of a recipient of the Order of the Silver Protea may be presented with a broach and citation recognising the support they have given to their partner. Awarded to Members and employees for further and continued distinguished Service, beyond that considered for the Order of the Silver Protea. The Order comprises a bronze fleur-de-lys pinned to the Cloth emblem and on the ribbon. It is accompanied by a Citation and a Certificate signed by the Chief Scout. Awarded to Members of exceptional character for especially distinguished service of the highest order. The cloth emblem consisting of a figure-of-eight knot, in green and yellow. A miniature lapel badge may be worn by administrative members or employees. This Order is also awarded to the Chief Scout upon his/her appointment to that position. On the recommendation of the Chief Commissioner or Regional Commissioner, the spouse / partner of a recipient of the Order of the Silver Springbok may be presented with a broach and citation recognising the support they have given to their partner. 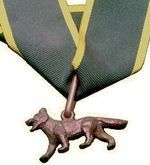 The Bronze Wolf is the only award made by the World Scout Committee. It is given solely in recognition of outstanding service by an individual to the World Scout Movement. This is the highest award that the Africa Region can bestow. Only three South Africans have received this award. Awarded to Scouts who are of an exceptional character and who show devotion to duty, great courage and endurance or gallantry. Awarded for gallantry with limited personal risk. The Award comprises a Citation and a Certificate signed by the Chief Scout. The cloth emblem consists of a figure-of-eight knot in white with red ends. Awarded for gallantry with moderate risk. The Award comprises a Bronze Cross with Red Ribbon. It is accompanied by a Citation and a Certificate signed by the Chief Scout and a cloth emblem consisting of a figure-of-eight knot in red. Awarded for gallantry with significant risk. The Award comprises a Silver Cross with Blue Ribbon. It is accompanied by a Citation and a Certificate signed by the Chief Scout and a cloth emblem consisting of a figure-of-eight knot in blue. The highest possible award for gallantry, with very significant perseverance, endurance and heroism with very significant personal risk. The Award comprises a Gilt Cross with Blue & Red vertical striped ribbon. It is accompanied by a Citation and a Certificate signed by the Chief Scout and a cloth emblem consisting of a figure-of-eight knot in blue & red. May be proposed by any Member to any person (who is not an active Member), or organisation who gives significant support to Scouting. This Award should be ratified by the Regional Commissioner who will issue a signed certificate to accompany the Thanks Badge. See the Star Awards page for details of Troop, Pack, and Patrol Star Awards. The Leaping Wolf is the highest award a South African Cub can attain today. The Cub works towards this badge during the final year before leaving the Pack at the age of eleven. The Springbok Scout Badge is the highest award a South African Scout can attain today. The Bar is worn by Adult Scouters who have attained the Springbok Award. One of the highest achievable challenge awards for scouts is that of the Cord or Thong. There are 3 types, namely: The Airman’s Cord, The Bosun’s cord and The Bushman’s Thong. See BP Rover Award for more details, and for a list of recipients. The Wood Badge is the highest achievement award to Scouters, registered Rovers and persons holding designated or Honorary Rank who complete respective courses of training. Wood Badge holders are seen as Scouting’s elite group of Scouters. The Badge consists of two copies of the wooden beads from a necklace originally belonging to King Dinizulu. One extra bead is worn by Assistant Adult Leader Trainers and two extra by Leader Trainers. The beads are worn on a leather bootlace around the neck of the holder in uniform. It carries with it life membership of the 1st Gilwell Group in England, the right to wear the ‘Gilwell Grey’ scarf with a patch of the Maclaren tartan on the point and the special leather Wood Badge Woggle. Wood Badge to read about the origin of the Wood Badge beads. ↑ For "distinguished services to the cause of mountaineering in South Africa, his fine record of climbing in Africa and overseas, and his outstanding achievements as the Editor of the Mountain Club Journal". This page was last modified on 16 December 2018, at 07:51.